The Expedition 24 space station crew members participate in a ceremonial change of command ceremony aboard the International Space Station Wednesday. This storywas updated at 4 p.m. ET. A trio ofastronauts on the International Space Station are gearing up for their secondattempt to return to Earth after an unprecedented glitch prevented their Soyuzspacecraft from undocking from the outpost yesterday (Sept. 23). The Soyuzcrew ? NASA astronaut Tracy Caldwell Dyson and Russian cosmonauts AlexanderSkvortsov and Mikhail Kornienko ? will try to leave the station again tonightat 10:02 p.m. EDT (0200 GMT). If all goesaccording to plan, the spaceflyers will land on the steppes of Kazakhstan in CentralAsia Saturday, Sept. 25, at 1:21 a.m. EDT (0521 GMT). Theastronauts' homecoming was delayed by a day as Russian engineers scrambled tocorrect the malfunctioning microswitch that refused to release a set ofhooks and latches on the space station's Russian Poisk docking port. Themicroswitch issue caused hours of delays, and eventually forced Mission Controland the astronauts to scrap undocking and landing plans for a day. The Soyuzcrew returned inside the space station, and the 12 Russian recovery helicoptersawaiting their landing in Kazakhstan went back to their home airfields. Overnight,the space station crew rigged up cables to fix the docking port to set thestage for tonight's Soyuz departure. "Spacestation crew members installed a series of jumpers, bypassing a failedcomponent that had prevented commands from being received by the Russian Poiskmodule's docking mechanism," NASA officials said in a status update. "Once the jumpers were in place, the Poisk module hooks and latches weresuccessfully opened." Thehook-and-latch system on the Soyuz remains closed, securing the spacecraft tothe station, they added. The spacestation's Poisk docking port is on the top of the orbitinglaboratory's Russian segment. It was delivered in 2009 and entered use forvisiting Russian spaceships earlier this year. This will bethe first undocking conducted at the Poisk module, so Russian engineers will beclosely analyzing the problem, said NASA spokesman Rob Navias. 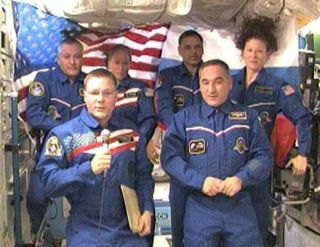 The Poisk modulewill also be the same port that the next three space station crewmembers arriveat on Oct. 10. "Thecurrent plan is to keep these jumper cables in place, so that there is acommanding path that is assured to reclose the hooks after the new Soyuzarrives at the station on October 10," Navias told SPACE.com. "They'llbring up some spare parts and do some troubleshooting so that this problem isalleviated in the future." The moduleis just over 13 feet (4 meters) long, about 8 feet (2.5 meters) wide and weighsabout 8,000 pounds (17,636 kg). It has about 380 cubic feet (10.7 cubic meters)of living space inside. NASA willbroadcast the upcoming Soyuz spacecraft undocking and landing live on NASA TV, beginning at 9:45 p.m. ET. Click here for space station missionupdates and a link to NASA TV.